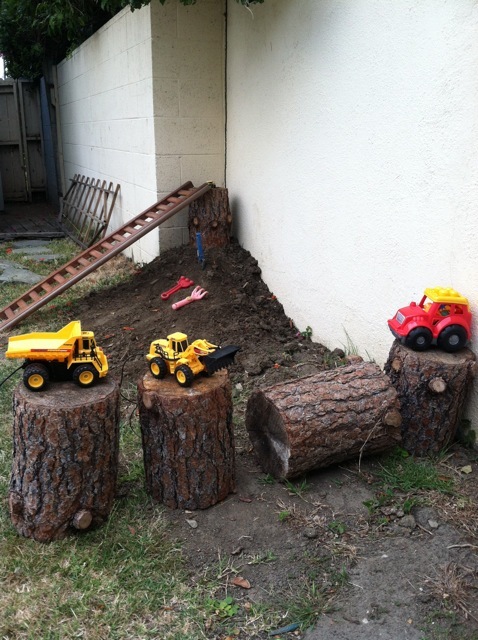 Welcome to the latest addition to our summer backyard play spaces, the dirt pile. I consider this The Explorers’ answer to the mud pie kitchen. Not that they don’t like making the occasional mud pie; they just much prefer running cars and trucks through a pile of dirt. Last fall, the hubby did some serious digging in our backyard to replace a space of grass with pavers for a seating area. The dug-up dirt has been sitting in a far-off corner of our yard ever since. All it took to make our magical dirt pile was some elbow grease – shoveling the dirt via wheelbarrow from one part of the yard to the other. The Explorers helped select a good spot and oversaw the “building up” of the dirt pile to just the right specifications. They also wanted to add a few of the tree stumps we inherited last fall. The “ladder” leaning against the stump in the back here was a find on one of our nightly neighborhood walks. If you don’t have unused dirt of your own, consider buying some at a local garden supply store. You don’t need much – even a small mound will do the trick. The dirt pile is popular around here. Really popular. The Explorers love pushing their large-size trucks through the dirt, racing each other to the top of the pile. And they’re dreaming up all sorts of things they want to try this summer. I’ll keep you posted. On a side note: These days, the kids seem to get on each others’ nerves. A lot. But I’ve noticed that they set aside their differences when they get to the dirt pile. Here they work together to play, explore and dream up new ideas. All that from a pile of dirt. How about you – would you consider building a dirt pile in your backyard? Hey Sarah, nice to meet you! I love meeting like-minded souls. Off to check out your blog now. Yay, Katie, that sounds awesome. I can&#39;t believe it took me so long to create such a simple area. Hope yours brings you as much fun as ours has. We are starting to really think about our outdoor space as well. We have added a small garden and a tent pad for the backyard campout, but we are still looking to redefine some areas for play. This is the perfect solution and we have just the spot! Thanks for sharing! Thanks for sharing your story. 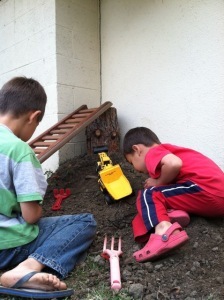 When I was a kid, my brother &amp; I spent hours in the backyard playing in the dirt (among other grand parent-free adventures). Our yard was much bigger &amp; less developed than the yards of today. 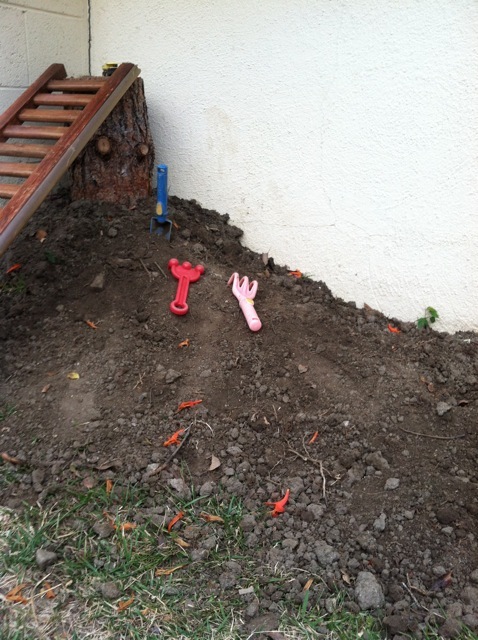 I&#39;m embarrassed it took me this long to realize that a dirt pile should be the first addition to any outdoor kid space. That is something I hear from a lot of parents, Jean – and certainly another way to get kids playing in the dirt. Yeah, we don&#39;t either. Although these days I find that a good hosing down outside helps greatly reduce the dirt showing up in the bath or shower. 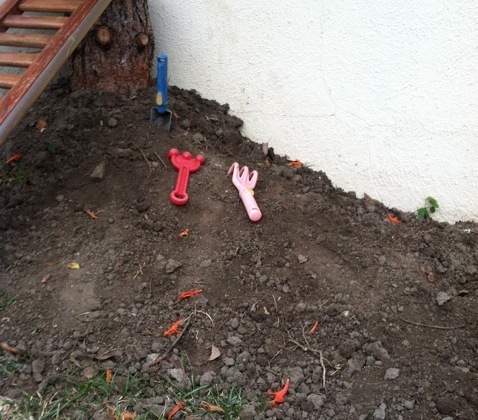 I let the kids dig in the garden. 😉 That seems to keep them happy. That is, if they can find it around the weeds. Ha! Yep! Our kids LOVE dirt. The wetter, and the muddier the better! Our bathtub HATES that our kids love dirt, though. But we don&#39;t consider our bathtubs&#39;s&#39;s feelings in most of our decision making.